Topical comedian & writer Ian Stone is currently a regular guest on 'The Gabby Logan Show' (current affairs, politics & showbiz show on BBC Radio 5) & 'Fighting Talk' (sports show on BBC Radio 5). Prior to this he was a regular guest on the Julian Worricker Show (BBC Radio 5) and Sandi Toksvig's LBC show. He's appeared several times on 'The Late Edition' (BBC 4) & Mock The Week (BBC 2) and is a commissioned writer on the Omid Djalili Show (BBC 1). He's also recently had a sitcom pilot commissioned by BBC Radio 2, which stars Alistair McGowan. Ranked amongst the top ten stand-ups in Britain by The Independent, Ian is also a member of the Comedy Store's critically acclaimed Cutting Edge team - where you can see him perform most Tuesdays. 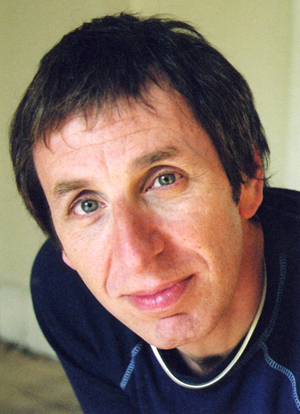 Ian has performed all over the world including Comedy Festivals in Australia, New Zealand, Hong Kong, South Africa, Holland, France, Ireland and Germany He has also performed on tour with Omid Djalili, Ardal O'Hanlon and Alan Davies. He has headlined gigs in Dubai and Abu Dhabi in the Middle East, performed on the final transatlantic crossing of The QE2, entertained troops in Kuwait and Bosnia and played various clubs in New York. He has headlined at the prestigious Yuk-Yuk clubs in Canada, compered the main theatre at the Cape Town Comedy Festival 2003 and performed his one-man show in South Africa's Camps Bay Theatre in 2004. More recently he became the first British stand-up to perform in Moscow. Ian's many television appearances include Mock The Week (BBC 2), The Last Word (MORE4), The Late Edition (BBC4), The World Stands Up (Paramount Comedy 2005) The Comedy Store (Ch5 - 3 appearances, most recent in 2005), Never Mind The Buzzcocks (BBC 2), The Stand-Up Show (BBC 1), Saturday Live (ITV), Live at Jongleurs (ITV) & The 11 O'clock Show (CH4). On radio Ian is currently a regular guest on The Gabby Logan Programme and Fighting Talk (both for Radio 5) and was a regular guest on the Julian Worricker Show (BBC Radio 5) and Sandi Toksvig's LBC show. He appeared twice on 'Four at the Store' (BBC Radio 4) and was commissioned to do a number of specials for BBC Radio 7 about his travels to Moscow. On BBC London Ian hosted his own chat show "The Big Schmooze", where he interviewed the likes of Jeremy Issacs, Terry Hall, Anthony Sher and Esther Rantzen. Following his stint in America, he was invited to have a live discussion with Jackie Mason on BBC Radio 4's Front Row on the subject of Jewish comedians. Ian is a commissioned writer for The Omid Djalili show on BBC1 (2 series – with the 2nd series due for broadcast later in 2009) and has recently had a sitcom pilot commissioned by BBC Radio 2, which stars Alistair McGowan. He has also written gags for The Sketch Show on ITV1 and Alistair McGowan's Big Impression (BBC 1) and is a regular contributor to the Guardian, The Observer and The Independent On Sunday. In 2006 Ian returned to the Edinburgh Festival with his new solo show, 'Embrace the Chaos'. Ian received rave reviews, including a 5 star review from The Herald. He went back in 2007 with a brand new show, ‘Healthy Disrespect’ and garnered five four star reviews. Then in 2008 he returned to Edinburgh with yet another brand new show.